In which we see dead people, take several bus rides, and give Dan Brown a nod. …but in a good way. Today was to be our “bus” day. We always have one of those, where we take some long rides to see the sights and get our bearings. We started the morning at 5AM, faking sleep until 6AM when someone finally said, “You asleep?” and that ended that. Jet-lagged, but nearly in synch with Paris clocks (the apartment was still an hour off, by my calculation, so we’d started to reckon the hours by the church bells), we certainly weren’t moving quickly yet, and it took until 8AM before we had a bite and cleaned up for our day. First stop was the Metro station at Jussieu, where we attempted to buy a carnet of 10 tickets at the machine, but it wasn’t set up for our credit card (not even the Chip-and-Pin one), so my wife had to do her first battle in French. The woman at the info kiosk was helpful, cheerful, and gracious during the transaction, and we exited with a receipt, though we nearly forgot the tickets themselves. Next stop was a “tabac” shop to get a bus plan (since they didn’t have any at the Metro station—go figger). Aside from “Bonjour, Madame” and “Merci,” it seems that the one thing you can do to get on a shopkeeper’s good side is to hold the door for an aging widow who is the shopkeeper’s favorite customer. While the two women chatted and held hands, my wife and I searched the shop for maps, but to no avail. When the old widow had left, we asked the woman behind the counter and voila, there they were in a hidden cache behind some magazines. The shopkeeper especially approved of my choice of the map of bus routes. At €6,50, it was pricey, but since today was supposed to be a “bus” day, it was worth the coin. Then, naturally for a “bus” day, we started walking. We walked through Place de Contrescarpe with its ghosts of Hemingway and the rest, but it was shut up like a tomb at 9AM. Then we wound our way to the Pantheon. When we got there, we were met by an imposing structure that seemed to have no way in. This was not unusual for us; whenever we wander a city, we have a tendency to arrive at famous structures from the rear—I really don’t know why—and we’d done so here. So, we walked around the massive thing only to find that the front entrance was as blocked as the rear. Only later, when we arrived home, did we learn that the Pantheon was is closed until the 13th (our last day was to be the 10th). We left a little disappointed and headed down rue Sufflot to the Jardins de Luxembourg, where the place was abuzz with beeping bobcats, those miniature backhoes used in small-scale construction. 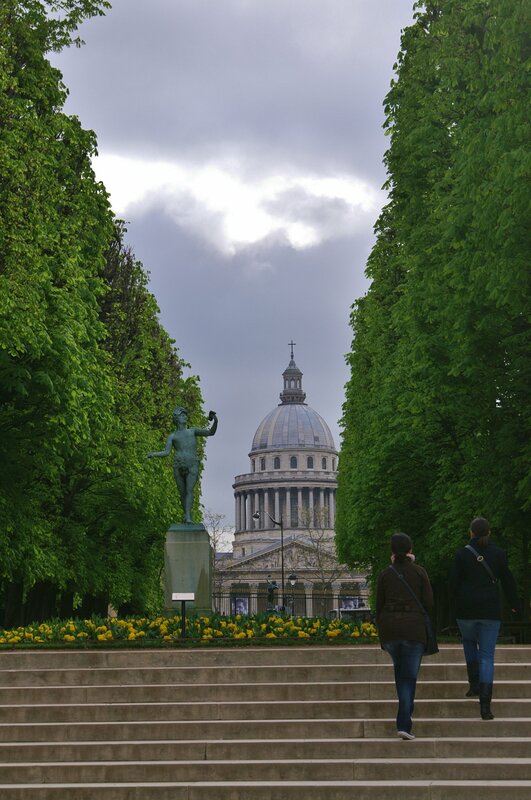 Travel tip: the gardens in Paris are not their best in early April; the lawns are green, but the beds are unplanted (at least in the famous gardens). So we walked around the beautiful lawns in the garden and admired the dozen or so statues of Medici queens and countesses that ring the place. 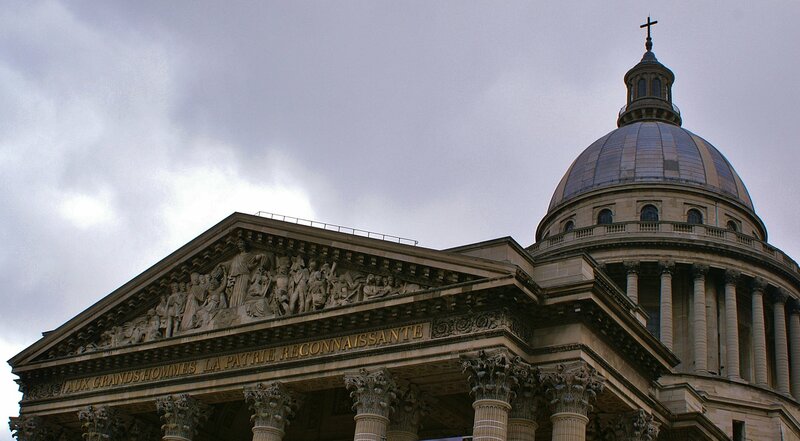 Then, walking around the backside of the Senat (never saw the front of that building…nice flower plantings there, though), we had a little surprise. 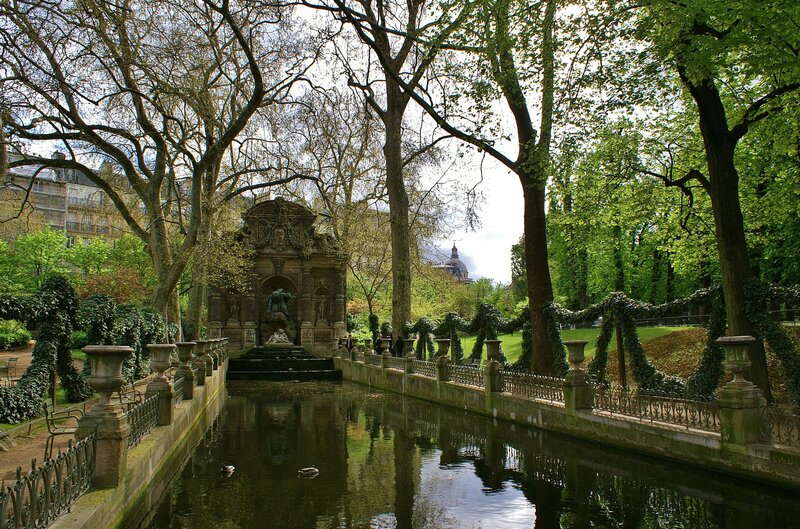 The Fontaine de Medicis is tucked away like an afterthought to one side of the Senat and the Jardins. Its Italianate garlands of live ivy flank a long reflecting pool (favored by the Parisian mallards), and really looks like it was transported from Rome, rather than built in Paris. Along the sides of the pool are stone urns which probably hold sprays of draping flowers at the height of summer, but which now were empty—save one, which had a Mme. Mallard, brooding on her clutch of eggs. She gave me the stink-eye when I unwittingly got too close, but smoothed her feathers when I backed off. Heading around to the front of the Senat we came down with “Oh, look, a chicken!” disease when we saw the sign for St Sulpice. This made us forget all about the front of the Senat, the Musee de Luxembourg that was beyond it, and the exhibition of Cranach housed in the museum; instead, we went running off to see the church Dan Brown made famous. Eglise Saint Sulpice is as pretty on the outside as it is on the inside, and it’s real plain on the inside. The outside is a mish-mosh of Doric and Ionic columns (they saved the Corinthians for the inside), and the façade has a square tower on the north side and an octagonal one on the south side, like mismatched salt-and-pepper shakers. Where Notre Dame is lacy and feminine, this church is definitely butch, like all it really needed were some Doc Marten boots and a baseball cap. Inside, it was best described as grey and unexciting. Sure, there is the Rose Line and the Gnomon Astronomique that played such a large part in The Da Vinci Code, but the only thing that made me perk up was when I turned around and saw the massive pipes of the organ. But even those looked like they needed a serious dusting. Still, someone has to set the low-end of the bar, and St Sulpice did that nicely. A quick two-mile walk to home, and after a break for lunch we would eventually head out and, hey, catch a bus! While my wife napped, I studied the bus route maps. There is no “circle” route in Paris that one can take as a Poor Man’s substitute for the expensive double-decker tourist jobs (€24-29/person? Ow!) but there are some long bus routes that take you past a lot of the major sites and they’d do in a pinch. We decided on the #61 bus, which meant we had to walk down through the Jardins des Plantes to Gare d’Austerlitz to catch it. Unbeknownst to us, the Jardins des Plantes have much more than botanical gardens; they have a menagerie, a geological/mineralogical building, a paleontology building, an historical museum, and a couple other buildings that we just didn’t know about beforehand. We noted it all for the future, and kept going. Route 61 takes you from the east end of city center to the east end of town, but we were only going as far as the Pere Lachaise Cemetery. The buses in Paris are easy to understand, the route lists are easy to figure out, and all the buses have reader boards inside to tell you what stop is coming up next and estimated times to when you’re going to reach a major destination point. It was easy to know, then when we needed to disembark. Cemitiere Pere Lachaise sits up on a hilltop, so you never see the whole thing at once. This is probably a good thing, because if you did, you’d turn around and go somewhere else. It is huge. No, I mean really huge. Okay…Imagine something huge. Now double it. Quadruple it. That’s the huge I’m going for here. After we got home, footsore and mind-boggled, I looked up some facts and figures. It’s 118 acres. That’s almost a square kilometer. It holds over 300,000 bodies, plus many more in the columbarium. Like I said, it’s frakking huge. We picked three tombs to search for—we didn’t see anyplace to get a brochure/map of the place, so I took a picture of the map at the gate and kept referring back to it on my camera’s little readout (love my digital SLR!). I wasn’t the only one doing this. Jim Morrison’s grave was our first target, but to find Jim, you don’t need a map. Just follow the large groups of jabbering twenty-somethings and the small groups of weepy-eyed middle-aged duffers, and you’ll find it. It’s an unassuming headstone, vandalized over the years, strewn with fresh flowers. Meh. Second, we searched for but couldn’t find Oscar Wilde—we were in the right spot according to the map, but Oscar just wasn’t there—I think the French may not have liked having him there and just screwed up the map to spite him. But we found our third target, Marcel Proust (plus his brother and his brother’s wife), interred right where the map said they would be. The many chestnuts piled on his grave told us he’d had many recent visitors. As I said, the thing about Pere Lachaise is its size. It goes on forever and at times really does look like a true necropolis. Some of the graves are in poor repair—doors to crypts hang open, sepulcher stones are moved off to the side, headstones have fallen forward, lying cracked, broken. 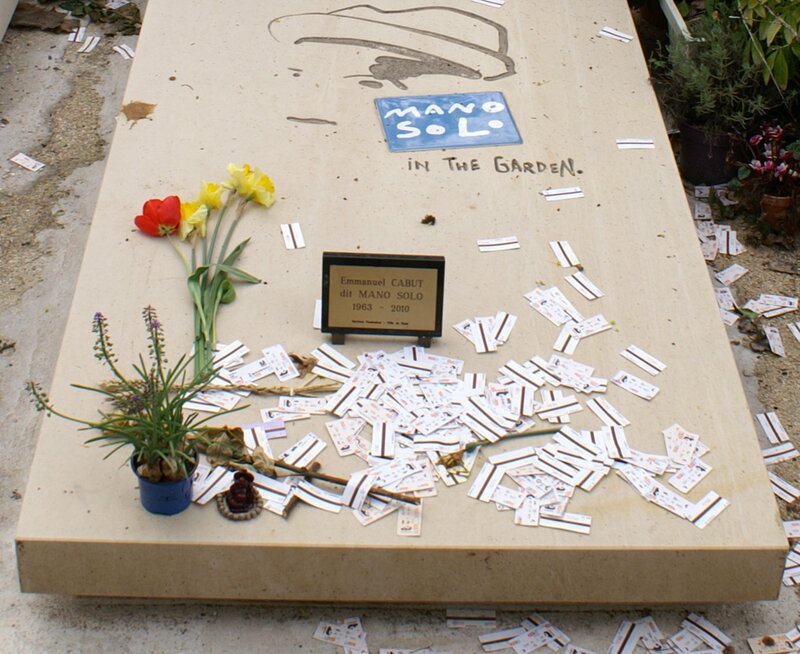 There are also new graves, including the one we saw of Emmanuel Cabut, a punk musician also known as Mano Solo. He played with the band called “The Chihuahuas” and died an early death. His grave is strewn with the little tickets you use on the Metro; we left ours, wondered what it meant, and as we turned, we understood: Mano Solo has had his ticket punched. The mixture of graves from the 1800s next to some from the 1930s next to some from last year is really weird. The weirdest thing, though, was passing by the beautifully creepy crematorium, with its bronze-leafed dome and concrete stacks. “I wonder if it’s still a working crematorium,” I said. Then a hearse drove by, the guys got out, threw the flowers into a dumpster, pulled out a beautiful oaken casket, and carted it inside. Ayup. Still working. The #69 bus took us from Pere Lachaise in the east all the way across the city to Champs de Mars in the west. If you want to do this, remember this tip: Don’t do it at rush hour. Alas for us, we’d spent too much time searching for dead friends, so when we started back into town, it was 5PM and the bus was already full. Standing on a bus isn’t a good way to see the sights, but we saw some. Mostly, though, we just saw the one at the end of the line. 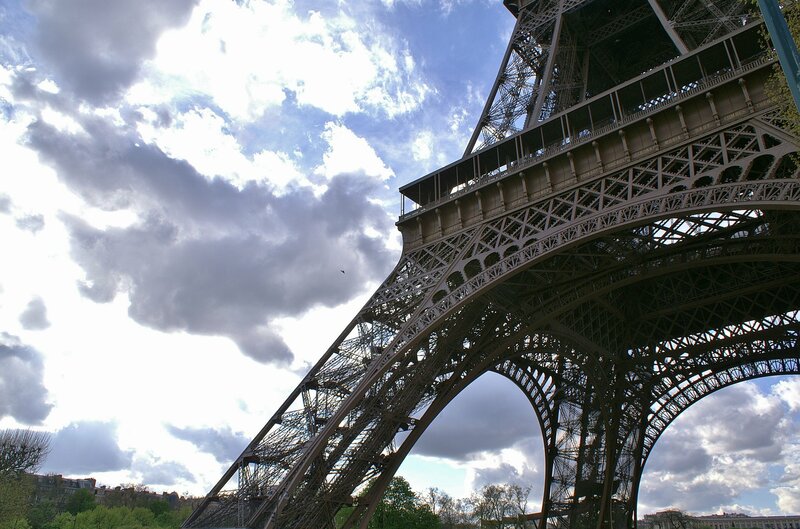 The Eiffel Tower is such an icon, so overused, so souvenir-ish, that I really didn’t expect much. Still, I found myself grinning like Forrest Gump when we caught sight of it down the boulevard and then over the tops of the buildings as we wound our painfully slow way westward. When we got to the Champs de Mars, the sun was breaking through the clouds, and the air was clean and crisp. The tower is big—no two ways about that—but it’s also like one of those Mandelbrot fractal designs: the closer you get, the more detail you see. And I gotta tell ya, it’s a beautiful thing. The curves, the balance of height to base, the intricate web of iron, the names of scientists and mathematicians that ring its levels, I mean it’s just elegant. And because I wanted to see it and not see things from it, we didn’t spend the euros for a trip to the top. It was a long (2+ hour) wait, to start with, and then there is no way my wife, with her vertigo around Big Things, was going anywhere near it, much less up it. From the Champs de Mars, the #87 bus took us home via a long trip along the Rive Gauche. 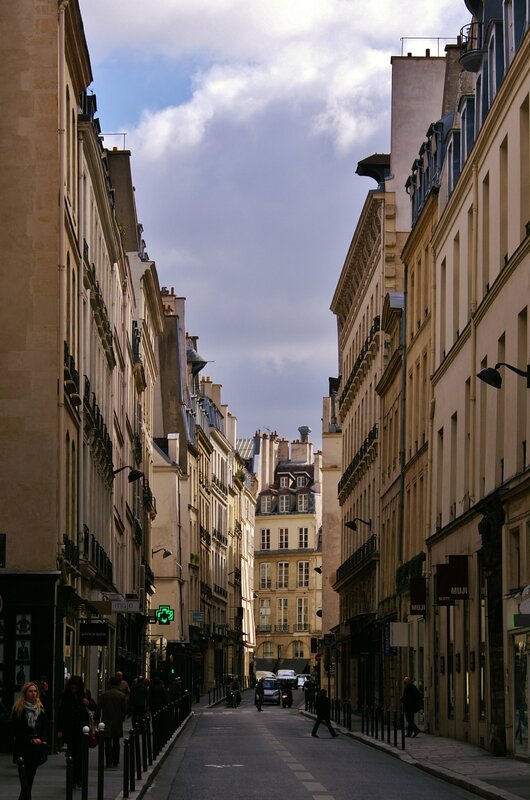 We went down the Boulevard Saint Michel (aka Boul-Mich), a very toney shopping district, and got dropped at the rue de Cardinal Limoine, where I immediately took us in the wrong direction—so much for our “bus day” giving me a feel for the lay of the land. Still, I realized my mistake within a block, turned us around, and headed us home, stopping at a boulangerie for baguettes en route. And we now know, the traditionale baguettes are shorter, tapered at the ends, fatter, and softer crusted (more like artisanal breads) while the normale baguettes are longer, thinner, rounded at the ends, and have a crisper crust. They’re both about €1,20 per. You have been warned.